Distinguished philosopher John Searle sets out to outline the importance of language for the development of society but ends up justifying the present social system. Review by Phil Sharpe. For John Searle, a key concept is “status function” which is seen as the relation of the role and functions that people have within society. The ability of status function to work is based on a process of acceptance or recognition between human beings which does not imply the necessity of approval. Humans also relate in terms of collective intentionality or the importance of conscious co-operative relations at the level of practice. Status functions also have powers which relates to their rights and obligations. They are also regulated by rules that define the criteria of the collective recognition of the status of persons and objects. Searle argues that “institutional facts” about society are based on human acceptance and relate to the rules that connect to the character of a person or object. Further, the relation between speech acts and institutional facts is created by declarations, which are either about the world or are about changing the world in the forms of instructions or commands. The result of this outline is to claim that social reality is constituted by institutional facts that are based on the importance of human experience. This means the character of the social world is essentially subjective in its being, which then leads Searle into all sorts of difficulties. It is true that our everyday language involves the importance of institutional facts and the recognition of the status of persons. Undoubtedly, we accept the role of Barack Obama as the President of the United States because of the very status function expressed by the speech act. But it has to be questioned whether language by itself is able to generate the very causes that explain why society is constructed in the manner that it is. The causes of the character of society have to be connected to important economic and political factors that have resulted in the development of particular types of societies with specific histories. It is also important to acknowledge that humans can collectively act to transform these societies if dissatisfaction with the existing order of things develops. Language can be a force for tradition and deference, or express radical dissatisfaction. Language can be radically expressed in terms of texts that campaign for change and acquire popularity and become the impulse for change. But the reasons for change will be primarily located in the limitations of the economic and political system. Searle, however, argues that language defines reality and explains why social reality is, in his view, subjectively constituted. This means reality is reduced to a collection of institutional facts and rules, and the relation of society to the processes of a material world that is ultimately independent of subjective thinking becomes obscured. Of course, it remains true that language has a tremendous influence upon how society develops and is important for the very capacity of humans to develop society in the first place. But society could not exist unless it had the capacity to relate and interact with objective nature and its materials which exist independently of society. If society were just linguistically constructed it would have an independent relation to nature and have rules of existence that referred exclusively to the role of language. Searle surely does not mean to support this philosophical absurdity but his approach does justify this form of subjectivism and the denial of the importance of the relation of society to nature. His effective opposition to the realist standpoint inevitably results in the view that language constitutes reality. This is why he defines reality as “ontologically subjective”. He does outline a brief analysis of the importance of the biological to the development of language. But his empirical acceptance of the significance of the physical and biological is not consistently connected to his philosophical understanding of the role of language. He effectively justifies a dualist separation of the physical from the social. His emphasis on the importance of language for understanding the character of society has a conservative bias. This is because if language acts to reinforce existing institutions and relations between people the implication is that the present society is what is natural and effective. The result is to conceive language as the expression of tradition and stability and to ignore the very capacity of language to undermine the existing norms of grammar and social functions. For example the fact that the President of the United States represents an institutional rule becomes the ideological justification of this political role and criticism would be considered an arbitrary rejection of the status associated with this function. This standpoint effectively rejects the role of history which is replaced instead by the study of language and the emphasis it has in the constitution of social reality. What is actually required is a historical method that can differentiate the past from the present and outline how the past was transformed into the present. The significance of language will have an important relation to this task but it cannot be elevated into primary importance to the extent that language is said to have created social reality, as Searle does. The point being made by Searle is that the role of language conveys a sense of authority and legitimacy. If we establish a corporation then the very linguistic ability to define it in those terms will result in the collective recognition of society. The act of declaration provides for the status function of the organisation. The result is that people often consider institutions like private property or the role of money as natural and something that they cannot alter. But the question is what promotes this attitude? Searle would argue it is the result of linguistic convention. This does not explain the reasons for the linguistic conventions and why people accept them, however. It ignores the role of ideology that results in people attributing a permanent character to a transitory phenomenon. People consider that society is durable and secure if they are ideologically dominated by the ideas of the ruling class. In contrast, Searle implicitly suggests that the role of language acts as an ideological mechanism of society and it suggests conformity and collective acceptance. But this does not explain what the character of these ideas is. For example, it is unsatisfactory to argue that we accept the role of money because it is a linguistic term. It would be more satisfactory to suggest that money is accepted because it is an efficient universal medium of exchange for various goods. The social function of money is what creates the sense of universal acceptance. Searle accepts that language could mystify reality and express consistently false beliefs. Was it language or the structure of society that created the false belief? If it is language, it is possible to consider that society will never be changed because the same misleading words will continually be utilised in order to describe false representation of reality. The result will be the justification of a false belief system that will uphold a form of social injustice and the rule of elites. The very limitations within society actually promote the development of a radical language and the articulation of grievances and the creation of a serious challenge to the false belief system. This is why Searle’s tendency to uphold tradition is historically problematic and can be contrasted with the actual development of mass struggles when the existing ideology and language is weakened and undermined. Searle ask a crucial question: Why do we support a particular type of society rather than another one? His answer is that we have a sense of the capacity to make a particular choice rather than deciding in a different manner. This “gap” is what constitutes freedom. Hence the ability to vote for one particular candidate rather than a different one is what represents freedom. The choices we make are essentially voluntary and we could have made different decisions. Hence the suggestion is that in a society based on one-party rule we do not have this sense of freedom and instead our choice is limited to acceptance of the status quo. Searle does not relate his argument to the role of policy. The point is that in liberal democratic societies all the established parties support the austerity measures and so we do not have the choice to vote for a party that opposes cuts in public expenditure. This situation is creating support for extra-parliamentary mobilisation against the government’s measures. People do not feel represented and they are establishing their alternative forms of representation. In other words, the freedom of the political system is illusory and people are reinventing what they mean by freedom. This development is rejected as not being constructive by Searle because he considers that the existing system of liberal democracy is satisfactory. Searle’s answer concerning the human impulse for freedom is not satisfactory because of the empirical fact that humans have apparently generally accepted the condition of non-freedom. Searle glosses over this point and instead argues in arbitrary terms that freedom is realised within liberal democracy and the role of money and private property. Hence freedom is capitalism and from this political perspective he rules out any alternative conceptions of freedom. His over-generalised schema means that Searle cannot envisage any alternative conception of freedom and the role of the linguistic cannot sustain any different type of society. This is why he dismisses all conceptions of alternative societies as utopian; only capitalism provides the motivation to ensure that rules are enforced with the minimum of coercion. Only under capitalism are institutions truly enabling and the basis of free choice. This idealised view of capitalism not only underestimates the importance of the state but it also denies the importance of ideology for justifying the illusion of free choice and the rejection of the possibility to make choices that question the continuation of the system. The point is that choice under capitalism is constrained by the limitations imposed by the imperatives of the capital-labour system. Searle just assumes that this is a perpetually acceptable situation. Searle argues that this conception of universal rights is impractical and is based on the aspiration to a better society rather than an understanding of rights that could be realised. He contends that the rights that are truly universal are the right to freedom of speech, freedom of belief and the right of privacy and private property. It is interesting that the rights he considers to be valid and possible are the traditional rights of liberal democracy. The more socially-orientated rights are rejected because they represent the prospect of developing a different type of society in order to realise these rights. His standpoint is based on ideological bias rather than the development of an argument that social rights are not rights. Instead he is against the various social rights because they would apparently impose an obligation that he does not want to fulfil. Rights to housing, education and employment are apparently onerous and would imply a redistribution of resources and power that he would not agree with. Consequently the only rights that he is happy with are the rights of liberal democracy. The fact that the implementation of the Universal Declaration of Human rights would imply a transformation of economic and political power makes them unacceptable. He cannot argue that theses are not valid rights. Rather, he has political objections to them because their implementation would imply the creation of a type of society that he is opposed to. Only the implicit assumption that existing society is essentially sound and able to meet needs in an adequate manner can explain his standpoint. This is why he suggests we should support people trying to realise social rights but not consider these aspirations as an obligation. He assumes that the present system is capable of realising needs without a radical change of policy and an orientation towards the justification of universal human rights and obligations. His view is based on the denial of the inequality in the world that precisely provides the relevance of the Universal Declaration of Human Rights. Searle has written an accessible book that outlines the importance of language in the construction of society. His approach, however, results in an ideological bias in favour of capitalism. An interesting project would be a study of the relation of language to the process of social transformation rather than the preservation of liberal democracy and capitalism. 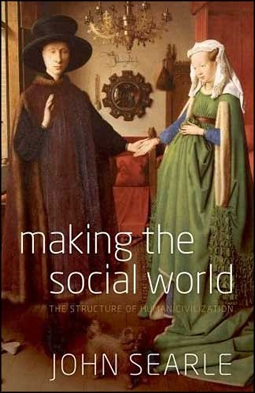 Making the Social World: the Structure of Human Civilization. John R Searle, Oxford University Press.